Looking for quality web design invoice templates? We've got you covered! Do I need more than just a web development invoice template? Your company develops web pages in order to get paid, so you shouldn't have to do the unpaid work of developing an invoice template site just to get paid for the work you've already done. We're here to help. 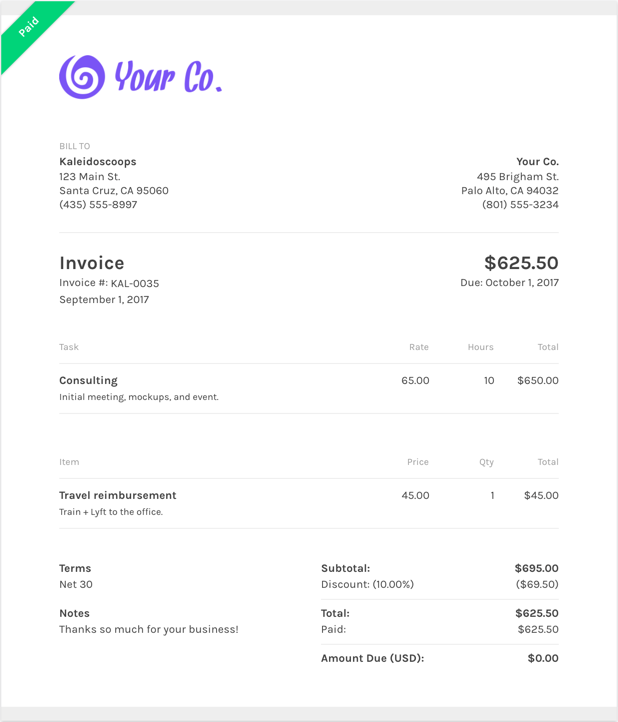 We've designed a free web development invoice template for you to use that also allows has features that allow you to set up recurring billing for your regular customers, credit card or PayPal processing to simplify online payment, and late payment reminders for when your clients forget to pay you. And it's all free! What should I include on my web development invoice template? One popular selling point about ZipBooks is that you can save default settings for your invoices once you nail down the details of what exactly should be on your invoice. Using ZipBooks for your web development invoice means never forgetting to include critical information. We’ve collected data from tens of thousands of invoices and use it to score your invoice based on what information you include so you’ll get you paid faster. You may not have gone into this looking for more than just a generic IT template, but since you found us, why not check it out?